Letter from the Office of M.J. Coldwell M.P., to Rev. L. Sauro, April 21, 1941. After his release, Sauro continued to help other internees and their families. This letter is a response to one Sauro had sent on behalf on internee Giuseppe Boccaccio (see ICEA2010-0008-0049 and ICEA2010-0008-0051). 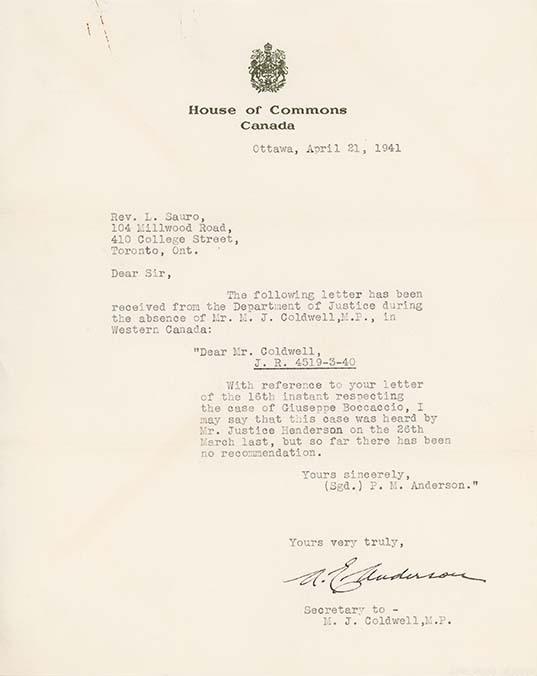 Recto: [t-b, l-r]: [printed on paper] [crest] / House of Commons / Canada [typed] Ottawa, April 21, 1941 / Rev. L. Sauro, / 104 Millwood Road, / 410 College Street, / Toronto, Ont. / Dear Sir, / The following letter had been / received from the Department of Justice during / the absence of Mr. M. J. Coldwell, M.P., in / Western Canada: / “Dear Mr. Coldwell, / J. R. 4519-3-40 / With reference to your letter / of the 16th instant respecting / the case of Giuseppe Boccaccio, I / may say that this case was heard by / Mr. Justice Henderson on the 26th / March last, but so far there has been / no recommendation. / Yours sincerely, / (Sgd.) P. M. Anderson.” / Yours very truly, [signature in ink] A. E Anderson [typed] Secretary to - / M. J. Coldwell, M.P.